I always thought this card was from Karazhan for some reason. But still, a 1 mana 2 damage that can essentially get huge damage pretty easily is good. Must have for tempo mage! Only hits minions bro, dont think thats instant 12-0, id be looking for better 10 mana combos if i were you. Wait, lemme get this straight. Always does 2 damage even if it's the first thing you do in the game. ANYTHING Savagery can do effectively, Arcane Blast does easier and more consistently. This need to be able to damage hero or it'll be lack luster since mage does not lack removal. If you could target heroes, it would literally be the most OP card for the Mage. Especially with a Freeze Mage deck. This actually is a very versatile removal. 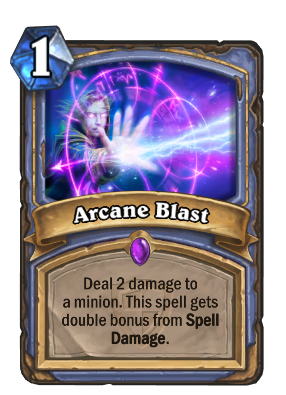 It can help control early aggression and its a great tempo/removal card when paired Spell damage (Azure Drakes). .
Malygos coin double arcane blast. 24 damage is slight overkill when mage has enough burst already. With one Spell Damage, this is a 1-mana Shadow Bolt. With three Spell Damage, this is a 1-mana Flame Lance. I can see why they made this card unable to target Heroes. If you're playing a Freeze mage running Malygos, then this card could be broken OP. If you get them all discounted by Thaurissan then: Malygos + Frostbolt + Ice Lance X2 + Arcane blast X2 = 9 mana 38 damage combo, or 10 mana 46 damage combo if you have the 2nd Frostbolt. Malygos brings minion-only pyroblast to the field. I feel like this card will be like a shield slam for mages. Bloodmage Thalnos and Azure Drakes are common in Mage decks so and could potentially turn this into a very cheap, efficient removal spell.